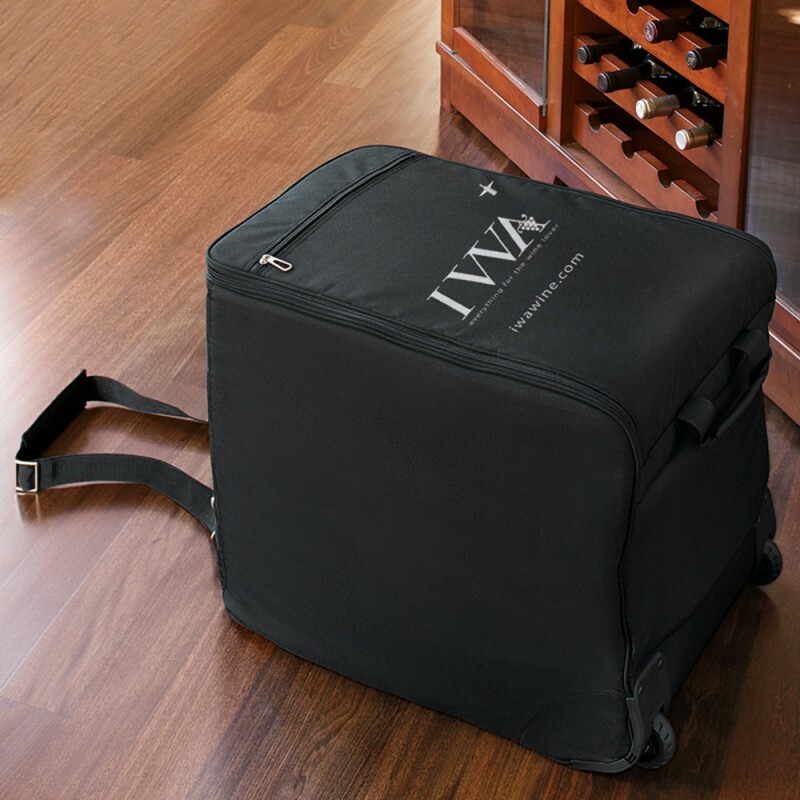 Wine Check Bag Only Black (P/N WINECHECK BLACK). Don't Ship Your Wine, Check It! The Wine Check is a safe, convenient, and economical way to ship up to one case (12 bottles) of wine to and from where ever you travel, in an FAA-approved package! Your wine is protected by Wine Check's patent-pending design, that encloses your wine in a wine shipper box* inside the secure padded case. It's lightweight (under 5 lbs.) and the attached wheels and strap make it easy to roll behind you! When packed with 12 bottles, The Wine Check stays under the 50 lb. airline weight limit for luggage! The Wine Check is collapsible and reusable, so you can store it and use it whenever you want to take wine with you. Whether you're purchasing wine on a vacation or want to take some on a trip, The Wine Check makes traveling with wine safe and easy and costs less then shipping it! Dimensions 22"H x 16"W x 17"D.
*Styrofoam shipper box, carton and cold pack not included. Purchase our Wine Check Complete Set to receive the Wine Check with the shipper box and 3oz cold pack. The Wine Check (Bag Only). Purchase our Wine Check Complete Set to receive the Wine Check Bag with the shipper box and 3 oz cold pack. If you purchase the bag only, the best places to look for a wine shipper box are offsite wine storage facilities, since they receive so many 1Set of 2 shipper boxes for their clients. Be sure to call ahead first. Also, local chain liquor and wine stores will sell 1Set of 2 shipper boxes in the back of the store. Also, larger wine shops often have 1Set of 2 shipper boxes that they are happy to unload for free or a small price.